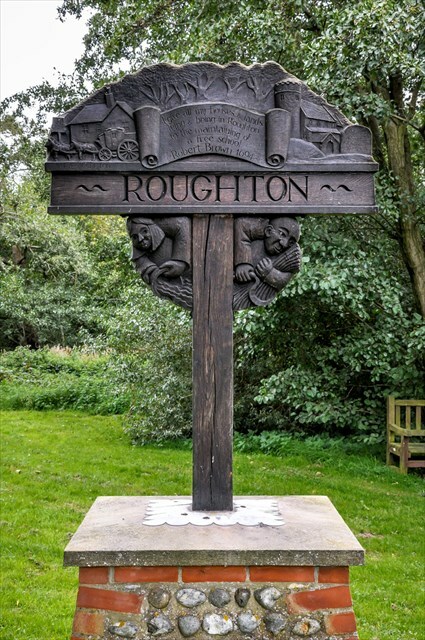 Roughton is a village and a civil parish in the English county of Norfolk. The village is 3.7 miles (6.0 km) south of Cromer, 19.6 miles (31.5 km) north of Norwich and 6.5 miles (10.5 km) north-west of North Walsham. It straddles the A140 between Cromer and Norwich and the B1463. Roughton church, St Mary's, is one of 124 existing round-tower churches in Norfolk. The tower is believed to be of Saxon origin and much of the main body of the building is Victorian. In September 1933, Albert Einstein was brought to live in a small hut on Roughton Heath after fleeing Nazi Germany. Commander Oliver Locker-Lampson MP offered Einstein a refuge in Norfolk before he travelled to the USA. While here, he was sculpted by Jacob Epstein. A blue plaque commemorating Einstein's stay can be found at the entrance of the public house in the village. On 7 October 1933, he set sail from Southampton, for a new life in the United States and never returned to Europe. The cache is near the village sign but NOT on it so please do not go climbing all over the sign!